Cheltenham Center for the Arts is pleased to be partnering with Open Book Bookstore for our Spring Fundraiser, to present a night of shared poetry. April is National Poetry Month, but we just can’t stop! We’ve invited some fantastic poets for a cabaret evening of spoken words. The night includes visiting poets, wine, tempting treats, art and books! 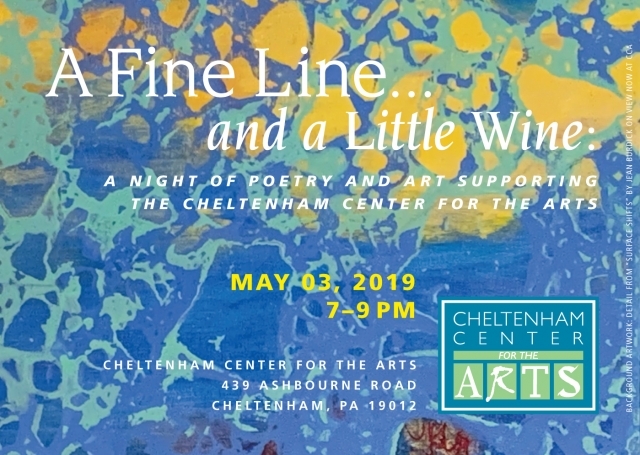 Join us to celebrate A Fine Line…in conjunction with our 76th Annual Juried Painting Show at the Cheltenham Center for the Arts! 7pm: Meet, gather, imbibe, snack, and browse the 76th Annual Juried Painting Show. 7:30pm: Round One begins. Our featured poets take turns at the mic and each share an original work. 8:10pm to 8:30pm: Round Two begins: our poets read again! 8:30 – 9 – You’re up! Poetry Open Mic Round: If you have a poem you’d like to read aloud, this is the time to do it! Here’s how it works. Come prepared and bring a poem with you (either original or not). If you want to read but don’t have a poem, we’ll have poems at the ready, inspired by the art exhibit. Each reader will sign up on-site during the event and is limited to no more than 3 minutes at the mic.